Untie The Ribbons: Flat Fluffy Flakes - Say That Five Times Fast! One World One Heart 2011 Is Here! Flat Fluffy Flakes - Say That Five Times Fast! 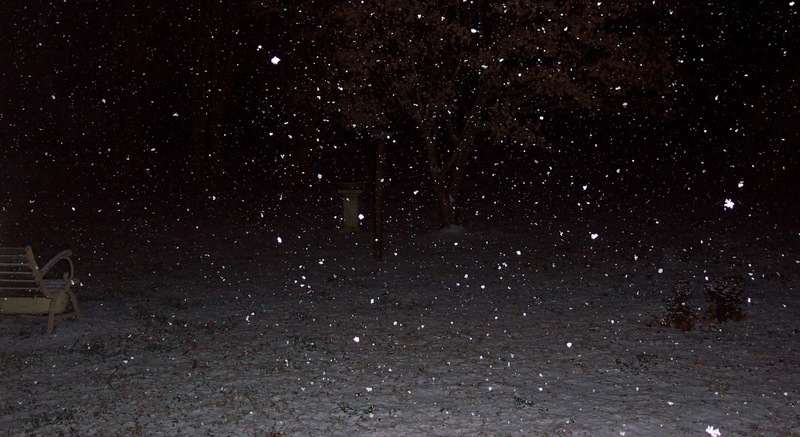 OK, so I'm a couple of days late LOL﻿ This was Sunday night as we watched the snow come down for hours. Saturday afternoon after I returned from NC, I went to WalMart to get a curtain panel for my step-father, completely forgetting that the "BIG STORM" was coming the next day. The place looked like a bomb had gone off and there were ten people in every line. No bread, milk, and a new one - bananas, to be found! Big mistake. On Sunday early evening, Jack and I went out for dinner about 35 minutes south. We were one of only two cars in the parking lot because the "BIG STORM" was supposed to hit at 7pm. When we went in I told the gal - guess everyone is at home drinking their milk and eating their bread LOL It had started sleeting a little on our way back home. 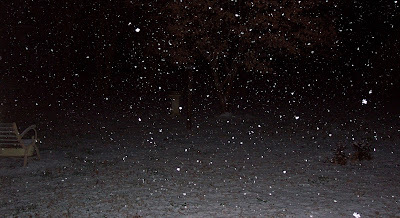 And the snowflakes above started in earnest an hour later. They were really beautiful to watch. Not so much fun for the little feral cat that we feed - sure hope he's been able to find a dry and warm spot to hole up at night! We had about three inches here but north Atlanta had much more. And of course we had freezing rain on Monday which turned our streets into big sheets of ice. Needless to say, for Georgia that's like four feet of snow anywhere else and no one has gone anywhere for two days. So far today it's pretty much melted on our street, driveway, and sidewalk. Big pot of chicken noodle soup for dinner tonight! Great soup weather! Well hello. You got more sleet that my neighborhood. We had no accumulation of freezing rain just pretty snow. Of course by Monday that had frozen on the streets. I feel very lucky, warm house, food to eat, and pretty scenery without the worry of no power! Glad I had no need to be anywhere but home. Some of the more traveled streets in the neighborhood are beginning to look almost normal, and I hear that some highways are passable. My husband is thinking about going to work tomorrow (Wed.) Surely he will check the news first. He usually goes up 285 and then north on 400 for several miles. That was fun and I am ready for spring. We used to live in Warner Robins and heard everything was shut down due to the snow. Unbelieveable!